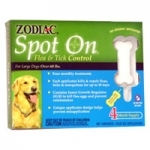 Zodiac Spot On treatments for Large Dogs 1CC / 4 Pack Contains Insect Growth Regulator (IGR) to kill flea eggs and prevent reinfestation. Each applicator kills and repels fleas, ticks, and mosquitoes for up to 30 days. Features the Pet Specifix Applicator and Accu-Tip Dispenser, which helps prevent misapplication. Each package contains a 4-month supply. 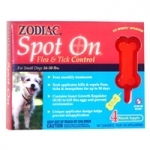 Zodiac Spot On treatments for Puppies, Toys, and Miniatures 1CC / 4 Pack Contains Insect Growth Regulator (IGR) to kill flea eggs and prevent reinfestation. Each applicator kills and repels fleas, ticks, and mosquitoes for up to 30 days. Features the Pet Specifix Applicator and Accu-Tip Dispenser, which helps prevent misapplication. Each package contains a 4-month supply. 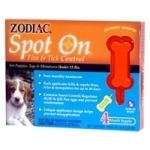 Zodiac Spot On treatments for Medium Dogs 1CC / 4 Pack Contains Insect Growth Regulator (IGR) to kill flea eggs and prevent reinfestation. 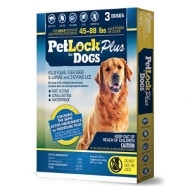 Each applicator kills and repels fleas, ticks, and mosquitoes for up to 30 days. Features the Pet Specifix Applicator and Accu-Tip Dispenser, which helps prevent misapplication. Each package contains a 4-month supply.